We’re starting to get English COTD for Trial Deck 10! [AUTO](VC/RC)[Generation Break 1] (Active if you have one or more face up G units in total on your (VC) or G zone):When this unit attacks a vanguard, this unit gets [Power] +4000 until end of that battle. 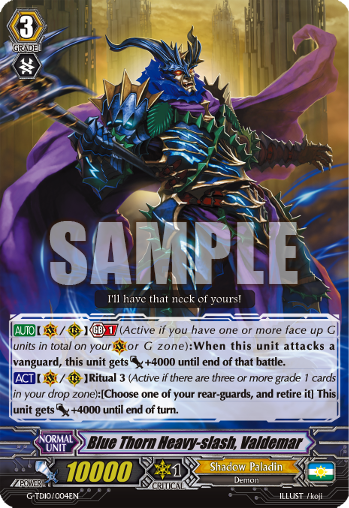 [ACT](VC/RC) Ritual 3 (Active if there are three or more grade 1 cards in your drop zone):[Choose one of your rear-guards, and retire it] This unit gets [Power] +4000 until end of turn.